My favorite sandwich disappeared when the café closed—and I stepped into the fray to recreate it. I grew up visiting the beaches of Westerly, Rhode Island—and on so many evenings, salty and sleepy, we'd drive over to the neighboring town of Watch Hill for the sunset, the people-watching, and the ice cream cones. On the way, we'd always stop for dinner at Fra's, an unassuming and extremely wonderful Italian deli. My order: the marinated green bean sandwich. At Fra's, we would make our requests to a sunbaked woman who stood over the cash register, taking down orders for pizza slices and hefty marinaras on a greasy notepad. When our orders were ready—wrapped in waxed paper, slapped onto a paper plate, and packed efficiently into white paper bags—we'd then climb back into the car, drive the 10 minutes to Watch Hill's harbor, and climb onto the stone wall by the water to eat. The green bean sandwich, served hot, felt special primarily because green beans always seemed like a bizarre sandwich topping, like something maybe discovered by accident—a much-better-than-expected result of using up leftover green beans by marinating in olive oil, vinegar, and red pepper flakes and cooking just beyond squeaky. Green beans are resistant to being held between two slices of bread (slippery, round), but that's okay here: Melted mozzarella (adhesive) and soft focaccia (easier to hold onto) are also involved. Fra's was the only place I've ever seen a green bean sandwich, and when it closed a few years back, I realized the only way I'd get another was by making it myself, recreated from fuzzy memories. Here's how to do it: Buy a focaccia, or make one (Saltie's is as good as it gets). Add more vinegar for a sharper-edged sandwich, or more red pepper flakes for a spicer one. Eat it hot or cold. Add roasted red peppers if you like, and eat the leftover green beans on their own. But for the full experience, you have to follow the sandwich as I did as a kid (and the first time I remade it): with an ice cream cone. We lived for these sandwiches and were so distraught when they closed. We are making these ASAP! Don't forget the roasted red peppers! this makes me so happy to read! i, too, was distraught to hear that they had closed. i hope this is close to what you remember! I have a friend who has made green bean sandwiches for years and years. Once she made one for me to take on a plane. It was so dripping with garlic and olive oil that everyone around me was either envious or annoyed. Delicious, but I now restrict them to home. The only other sandwich I've heard of that has green beans in it is the chacarero, a traditional Chilean sandwich. There's a really popular shop in Boston (called Chacarero, natch) that sells them made with grilled chicken or steak, Muenster cheese, tomatoes, avocado, and homemade bread. 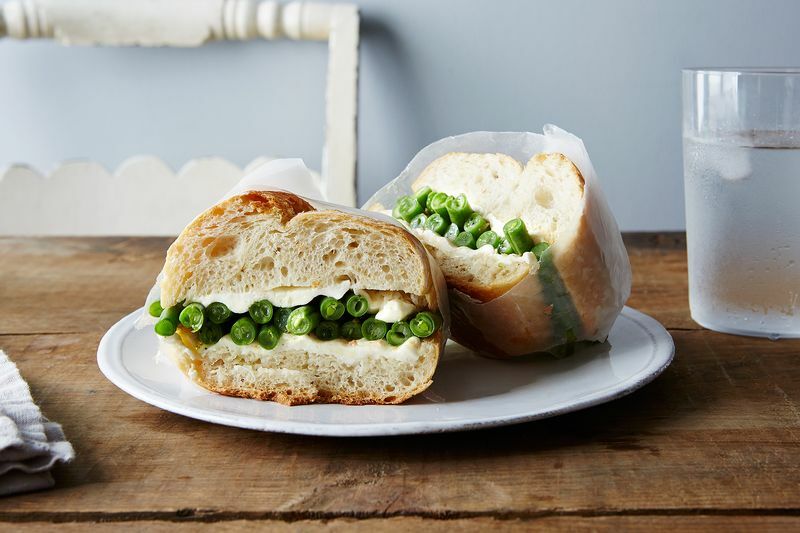 I've never really been a fan of green beans, but they're perfect in that sandwich! This sandwich was so delicious! Loved it. Thanks for sharing. This looks great to me. Upping the weird ante a bit: green bean and potato sandwich, with pesto smeared on the bread. Pasta with pesto, green beans and potatoes is a classic Ligurian combination, and I love pizza/flatbread topped with thin potato slices - at some point it occurred to me to swap pasta for bread (though, I use ciabatta.) I'll try this variation next! This looks so wonderful! The world needs more marinated vegetable sandwiches.